In 2006, the Orpheus Chamber Orchestra began the New Brandenburg Project, an effort to commission six new works inspired by Bach’s original Brandenburg Concertos (BWV 1046-51). Under the direction of Michael Christie, the Colorado Music Festival Chamber Orchestra will present Bach’s Brandenburg Concertos nos. 1, 3 and 6 (BWV 1046, 1048 and 1051), along with three works from the New Brandenburg Project; A Brandenburg Autumn by Stephen Hartke, Muse by Christopher Theofanidis, and Concerto with Echoes by Aaron Jay Kernis; on Sunday, 29 July 2012 at 7:30pm at Chautauqua Auditorium in Boulder. 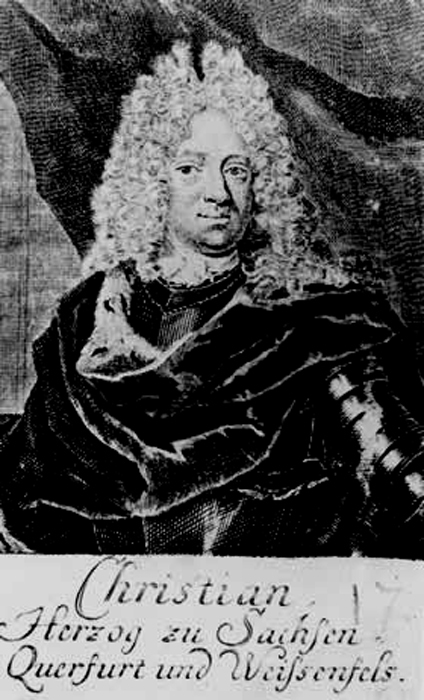 A Brandenburg Autumn was composed in response to a request from Orpheus for a new work using the same instrumentation as the first of Bach’s Brandenburg Concertos. This had, in fact, long been a particular project that I had wanted to pursue, and, as fortune would have it, I found myself in Germany as a Fellow at the American Academy in Berlin at the very time I had to compose it. 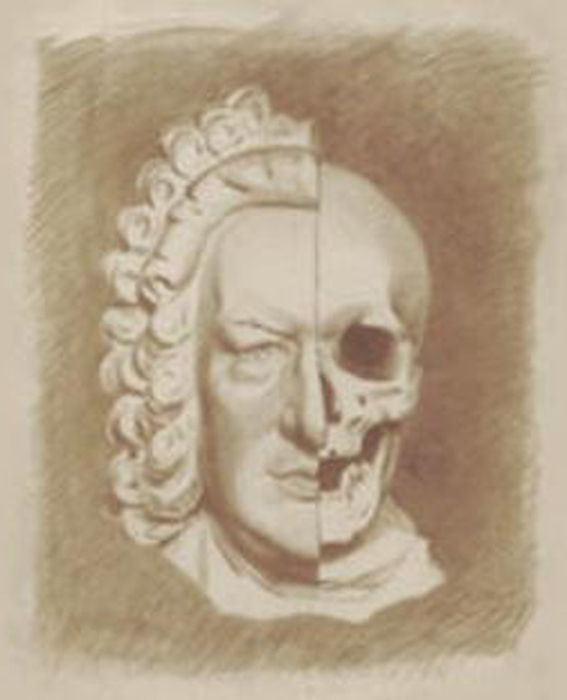 Thus the piece emerged as something of a musical diary of my impressions of living not far from the palace of Charlottenburg where the dedicatee of Bach’s Brandenburgs himself lived. The area of Brandenburg itself is, in fact, a land of lakes, and my studio was quite close to the Wannsee, the lake that borders on western Berlin as well as Potsdam, the capital of Brandenburg. The first movement – Nocturne: Barcarolle – is a musical sketch of the lake, even incorporating suggestions of the sound of halyards striking against the masts of the sailboats moored at a nearby marina. The third movement – Sarabande: Palaces – is the most autumnal of the movements, being very much about my strolling through the parks of Potsdam admiring the many Hohenzollern palaces and other buildings there. It is all very beautiful, especially that time of year with the trees changing color and the sky dark and feeling so very close. It was hard not to think about Bach coming here to visit his son Carl Philipp Emanuel, who was working at court, and, in the end, the movement came to have a few more overt references to the Baroque period. The idea of doing a sarabande came from my regular recreational playing-through of the Bach keyboard suites, in particular the English Suites – my favorite being the one in D minor (BWV 811). The harpsichord textures in this movement, then, spring from those of the Sarabande Double in that suite. A harmonic juxtaposition in the opening seems to have led me to quote a Hohenzollern melody: the theme by Frederick the Great that Bach elaborated in the Musical Offering (BWV 1089). Lastly, the fourth movement – Rejouissance: Hornpipe – was inspired by a desire to hear three English horns playing in unison fortissimo, and thus it begins, setting off a celebratory dance that I hope is reminiscent in spirit of the more outdoor sort of orchestral pieces of the High Baroque. Upon hearing the music of Christopher Theofanidis for the first time, one likely will not be surprised that it has been performed more than that of any other living American composer in recent years. 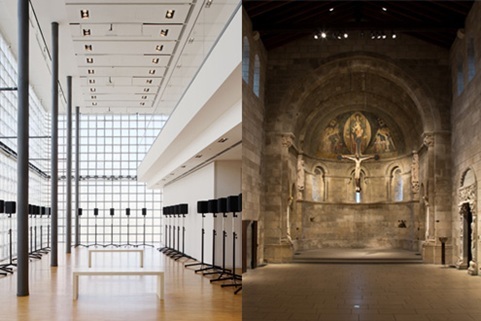 His vocabulary is at once sophisticated and guileless; with his affinity for blurred consonances, he conveys the repose of standing in a medieval church in the middle of a modern city. Much of Theofanidis’ music does in fact reference early music and liturgy, so in a sense he and Bach have dipped from the same wellspring. In Muse, the newest contribution to Orpheus’ New Brandenburg Project, Theofanidis ruminates on where Bach came from as well as where he arrived. With an instrumentation based on the Brandenburg Concerto no. 3, Muse further subdivides the triplicate string parts and grants the harpsichord an independent and prominent role. 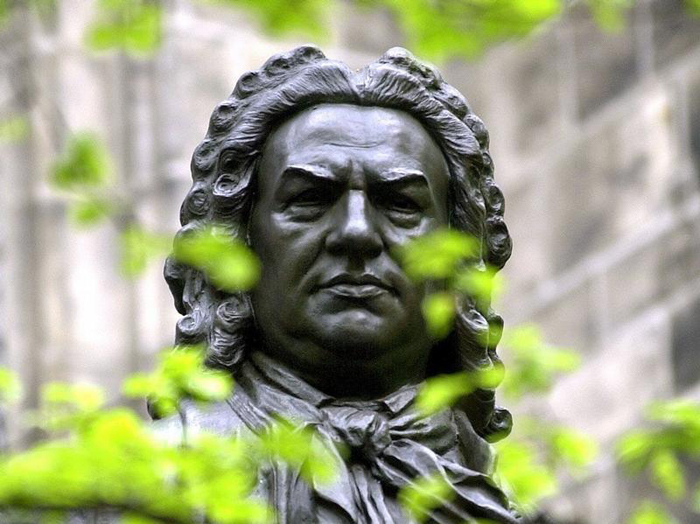 The brisk first movement seems to expand on Bach’s own kaleidoscopic prelude style. Theofanidis establishes a dark, neo-Gothic harmonic spectrum of old church modes darting through surprising pivots and chord changes, all whirled together with nearly perpetual motion handed off among the sections. The second movement, marked with the indication to perform it “with a light touch, ornate,” is quintessential Theofanidis: note its cascading major scales and arpeggios, nostalgic ornaments, and patient elaboration of material. The third movement explores directly Bach’s relationship to the past, specifically the Gregorian chant Veni, redemptor gentium which was adapted into the Bach chorale Nun komm, der Heiden Heiland (BWV 599). The essential element in Bach’s Brandenburg Concerto no. 6 that inspired Concerto with Echoes comes from the very first measure: the opening passage with two spiraling solo violas, like identical twins following each other breathlessly through a hall of mirrors. I also had in mind other Bach works that I think of constantly, such as the Ricercare, keyboard Toccatas, and the organ Passacaglia in C minor (BWV 582). The concerto also echoes some of my own recent works, as well as other composers I love who have paid homage to Bach in their music. Each of the Brandenburg Concertos is exceptional in its use of instruments. This concerto mirrors the sixth by using only violas, cellos and basses, while gradually adding reeds and horns to loop back to the sound world of the first Brandenburg Concerto (and extending it with trumpet and percussion). The first movement begins with a soft introduction that lays out some of the important building blocks of the concerto’s harmony, followed by a fiery, toccata-like virtuosic display. The lines in the movement are constantly mirrored and layered in a maze of sound. The heart of the piece, the slow movement, is essentially a Passacaglia built on slowly moving bass lines, mirrored layers of melody, and open harmonic spaces. Strongly consonant, its harmonies are built in imitative spirals, while the more angular climax uses compressions of the work’s opening harmonies. Rather than closing with a faster dance movement, the brief, slow Aria suggests a courtly dance, and is expressive and pensive, ending with a sigh rather than a flourish. Bach’s Brandenburg Concerto no. 1 in F Major (BWV 1046) will be performed at the 3 March 2012 Finale Concert of the Boulder Bach Festival at 7:30pm at Mountain View Methodist Church in Boulder. 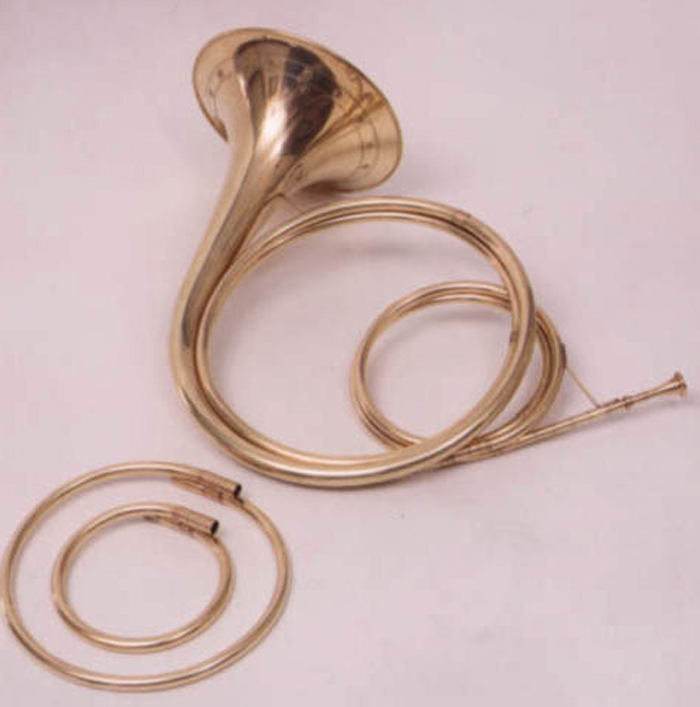 The Concerto opens with a fanfare that Horace Fitzpatrick has traced to a Saxon hunting horn call from the early eighteenth century. 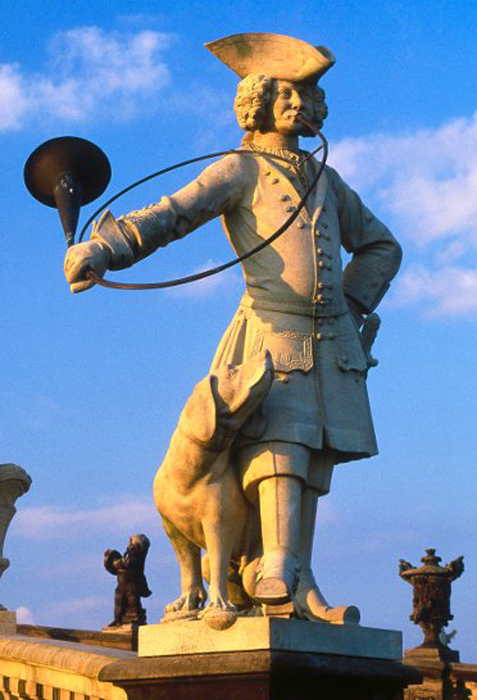 The strident cors de chasse used in the hunt were usually pitched in D and were wound in large, single hoops that could be worn diagonally across the hunters’ chests while on horseback, but Bach composed the Concerto for a pair of shorter, more tightly wound orchestral horns of either a fixed length that always sounded in the key of F or were fitted with terminal crooks that allowed them to be pitched in a variety of keys. Both of those types of horns could have easily played both the hunting and Bach fanfares as they call for only a few of the lower notes of the harmonic series that coincide with a major triad, but in the Concerto, Bach quickly abandons the simple vocabulary of the hunt and requires the hornists to take up the higher clarino register of the natural instrument that includes pitches of the harmonic series that only approximate a diatonic scale. In performances by orchestras that play modern instruments, these approximations are all but eliminated by employing pitch-altering devices (i.e., “valves”) that were grafted onto the natural instrument in the nineteenth century, but orchestras performing music of the eighteenth century on period instruments must take care to avoid a suspect performance practice that might be visually appealing but is historically implausible. 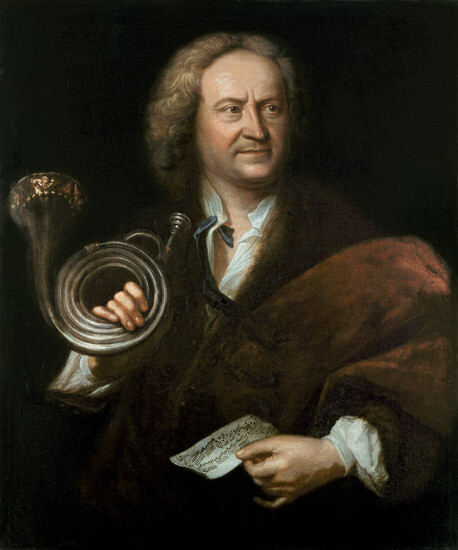 Therefore, when performing Bach’s horn parts on period instruments, the twentieth-century application of nodal venting, an entirely non-historical disfiguration of the Baroque horn that allows it to be played in tune with the bell upright, is much less appropriate than the technique of hand-stopping, a practice that is likely to have been embraced by hornists living only a short distance from Cöthen and Leipzig during Bach’s lifetime. While selections from Handel’s Messiah are nearly ubiquitous in North America at Christmastime, performances of Handel’s oratorio of 1741 are infrequent during the Christmas season in locales where German is the predominate language. For the most part, German-speaking audiences reserve Messiah for Lent and attend performances of Bach’s Christmas Oratorio (BWV 248) during Advent and the twelve days of Christmas. 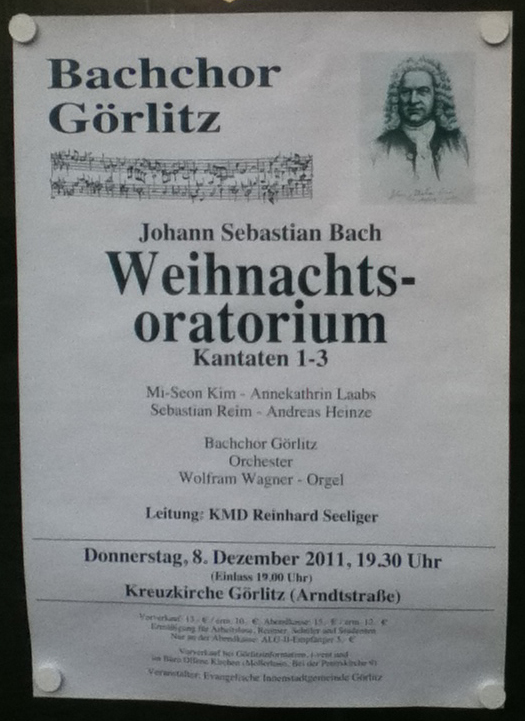 A performance of the Christmas Oratorio on 2 December 2011 at the Frauenkirche in Dresden illustrated the advantage of mounting Bach’s entire work in a single performance. 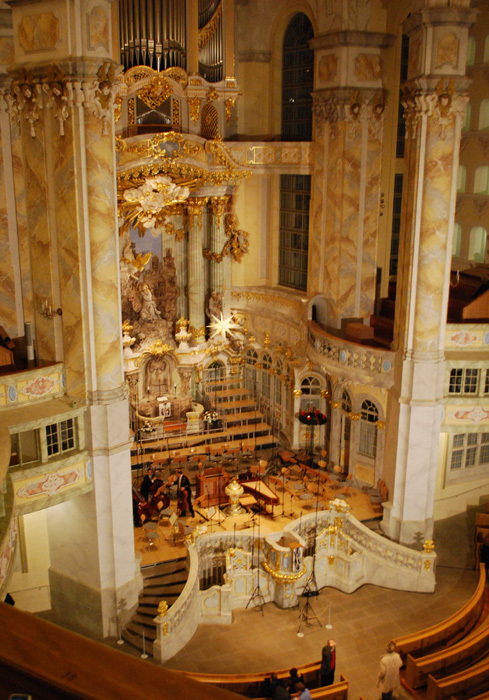 While the six parts of the oratorio were originally crafted to function as a series of individual cantatas to be performed over the course of the 1734-5 Christmas season, the three-hour Dresden performance was able to combine all six of the cantatas into a single arch of color and emotion that not only succeeded in preserving the sentiment unique to each cantata but also conveyed the balance and strength of Bach’s great construction. The Kammerchor der Frauenkirche, along with tenor Markus Brutscher and the Ensemble Frauenkirche, were primarily responsible for this success. 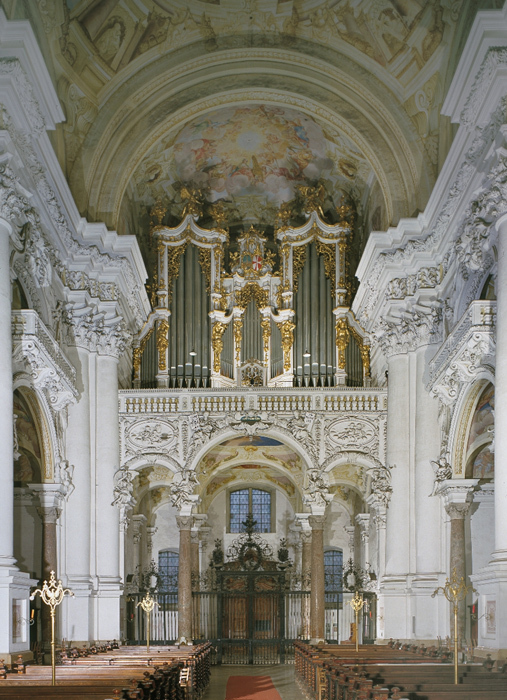 Under the direction of Matthias Grünert, the sound of the semi-professional chamber chorus, founded to celebrate the consecration of the reconstructed Frauenkirche in 2005, soared throughout the resonant church, tingling spines whenever the female sopranos chimed the melody of a chorale. In contrast to his narrative style as the Evangelist, Brutscher animated his arias and selected recitatives with great feeling. Yet, while the trumpeters and hornists flawlessly executed their passages of stratospheric brilliance, it was the two oboists who were the most impressive instrumentalists of all. Occasionally trading their regular instruments for more gently-voiced oboes d’amore and oboes da caccia with non-playing assistants, whose responsibility it was to keep all the instruments warm and in tune, this masterful pair proceeded to spin gorgeous countermelodies among the lines of the four vocal soloists throughout the evening. But the extraordinary excitement of this Christmas Oratorio performance may have been due as much to the behavior of the audience as to the perfection of the performers. Alerted by the onstage forest of microphone stands and a printed notice in the program that this performance was being recorded for commercial release, the Dresden audience sat in rapt attention and refused to breathe until the final chord’s last wisps of sound, floating upward into the distant heights of the church’s central dome, had disappeared into complete silence.